Welcome to the Microsoft BI Tutorials. The objective of these tutorials is to gain understanding of Microsoft BI Tool. We will cover topics such as event handlers, logging, scd and check points. Microsoft Business Intelligence is a process or set of activities such as extracting the business data from various operational sources, transform, and load the data into consolidated database or data ware house systems. - MSBI allows storing and retrieving data for smart processing and rapid decisions in business. - This Business Intelligence suite from Microsoft consists of resourceful tools providing best solutions for Business Intelligence. - The demand for SSAS, SSIS and SSRS Professionals is rising lately, and many reputed companies are looking for skilled business intelligent candidates. - The online training on BI is a complete package to learn all the mentioned SQL Server Services and tools. 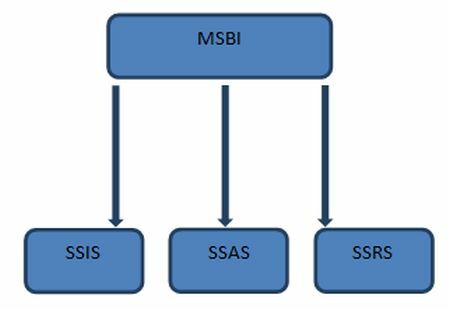 What is meant by MSBI technology? MSBI stands for Microsoft Business Intelligence. This powerful suite is composed of tools which helps in providing best solutions for Business Intelligence and Data Mining Queries. This tool uses Visual studio along with SQL server. It empower users to gain access to accurate and up-to-date information for better decision making in an organization. It offers different tools for different processes which are required in Business Intelligence (BI) solutions. Microsoft provides some tools to transform your business data into information. We can use these tools with the interface of Visual Studio. With the release of SQL Server 2012, Business Intelligence Development Studio (BIDS) was renamed to SQL Server Data Tools (SSDT). MSBI is composed of tools which helps in providing best solutions for Business Intelligence and Data Mining Queries. These are the three tools we are using for ETL, Analysis and reporting in MSBI. SSIS is the ETL tool from Microsoft. Integration Services is a platform for building high-performance data integration and workflow solutions, including extraction, transformation and loading (ETL) operations for data warehousing. We can process the data from various locations and various formats (source locations) and save the data into a centralized repository as a Data Warehouse/Data Mart (destination). It includes graphical tools and wizards for building and debugging packages. This tool is used for the integration like duping the data from one database to another like from Oracle to SQL Server or from Excel to Sql Server etc. This tool is also used for bulk transactions in the database like inserting lac's of records at once. This is the process of converting two dimensional (rows and columns/OLTP) data into multi-dimensional data model (OLTP). This will help you to analyze the large volume of data. This tool is used to analyse the performance of the sql server in terms of load balancing, heavy data, transaction etc. So it is more or less related to administration of the SQL Server using this tool. This is very powerful tool and through this we can analyse the data inserting in to the database like how many transactions happens in a second etc. - Security and so on. - Report builder helps to customize the reports for end user. - Export functionality with lots of format. - Display reports in various ways like tabular, chart, Gauge and so on.